Note: CUVs are crossover utility vehicles, and SUVs are sport utility vehicles. 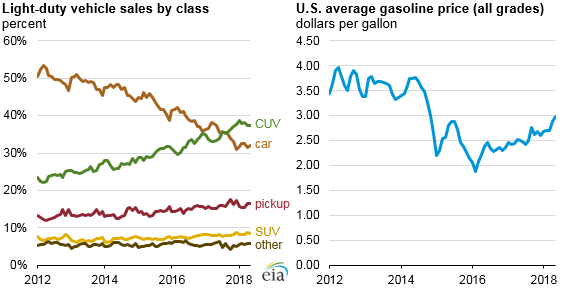 Trends in the sales shares of new light-duty vehicles by vehicle type have continued as the crossover utility vehicle (CUV) share of light-duty vehicles has increased, largely at the expense of cars, despite increases in gasoline prices over the previous two years. In each month since September 2017, sales of CUVs have exceeded those of cars, a class that includes sedans, hatchbacks, and sports cars. CUVs, which typically have ride height and interior space similar to truck-based sport utility vehicles (SUVs), are built on more fuel-efficient, car-based platforms and often have fuel economies that are only slightly lower than comparable cars. Vehicle sales shares for pickups, SUVs, and other vehicle types—which typically have much lower fuel economy than sedans and many CUVs—have remained relatively constant in recent years, with pickup shares showing comparatively modest gains. Although CUVs and cars are built on similar platforms, CUVs often have slightly lower fuel economy than their comparable sedan counterparts (for example, the Toyota RAV4 CUV versus the Toyota Camry sedan), even when they are equipped with the same engine and transmission. However, the change in vehicle shares from cars to CUVs had less effect on fuel consumption compared with other historical shifts in sales, such as the shift from cars to SUVs in the 1990s and early 2000s. The relatively small variability in annual fuel costs has not been enough to change purchasing trends in the same way that consumers exchanged low fuel economy SUVs for cars and CUVs in the peak of the recession in 2009. At that time, replacing a 20 mile-per-gallon (mpg) vehicle with a 30-mpg vehicle would save an annual 250 gallons when driven 15,000 miles, at a cost savings ranging from $500 ($2/gallon) to $1,000 ($4/gallon). CUVs often have fuel economy ratings that are more comparable to cars than to the fuel economy ratings of SUVs or pickups. Also, as fuel economy increases, cost savings from fuel consumption reductions decrease. For example, a consumer who drives 15,000 miles per year using a 35-mpg sedan consumes about 429 gallons of gasoline annually, while a 30-mpg CUV traveling the same distance would consume 500 gallons, a difference of 71 gallons. That difference in gasoline consumption would cost $143 to $285 annually with gasoline prices in the range of $2/gallon to $4/gallon.